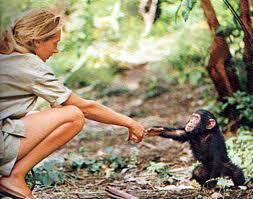 I met Jane Goodall once. I was an eager student of anthropology and had been devouring every book on primates and paleoanthropology I could find, including all of Goodall’s work. Miraculously, she came to speak at my college, and I planned to skip out of my favorite class to hear her presentation. In the week leading up to her appearance, I busily wrote out all the questions I wanted to ask her, just in case there was a chance to talk one on one. I tried to come up with complex questions, not ones that just anyone off the street would ask, oh no; these would be questions that showed I not only read her books but could offer deep insight into her findings. I was certain it would lead to a lively and stimulating exchange of ideas, and that this would be one of the better networking moments of my anthropological career. When the presentation ended, I hurried to the back of the auditorium to line up for her book signing. Along with every other person there. The line wrapped around the room, and it became clear to me that I was going to have about 30 seconds to impress Dr. Goodall. I was doomed. My hands got clammy and started to shake. As my turn approached, all rational thought deserted my brain. I reached out with my sticky hand, and barely managed to choke out a strangled, “I liked your book,” before receiving a cursory thank you and being guided away by the handlers. I had choked. All of this has little to do with today’s post except to emphasize my long-standing science crush on Jane Goodall. "Grub the Bush Baby" is the photo story of Jane's son's first two years in the forest at Gombe. In 1967, Jane Goodall brought her months-old son into the field with her at Gombe in Tanzania. Her careful observation of the reserve’s chimpanzees had shown her that they hunted, and often killed the young of other primates in the area, and she was concerned about the safety of her young son. In order to protect him from both the chimps and the many other wild animals in the area, she built him a cage. Both she and her son slept in it at night, and though it was painted a cheery blue and decorated with birds and stars, she received heavy criticism from a number of people about her child rearing methods. But she always maintained that “Grub”, as she nicknamed him, had led an extraordinary childhood. She took her parenting cues from the chimpanzees she studied, and noticed that, “chimp mothers… that were affectionate and tolerant raised babies that had good adult relationships and were successful community members”(Quote from Jane Goodall by Sudipta Bardhan-Quallan). She took six years away from direct fieldwork to raise him, and he accompanied her in her research travels around the countryside. Grub grew up running around the forests and plains of Africa, and in the process learned firsthand the value of the wild creatures surrounding him even when they were a direct danger to his family. Goodall has since formed the Jane Goodall Institute, a nonprofit organization devoted to promoting humanitarian, environmental and animal protection efforts around the globe. As part of the institute’s efforts to reach out to youth, Goodall formed a program to help children become actively involved in influencing the world around them. Roots and Shoots encourages youth-led campaigns to effect positive change in the three focus areas of the institute, and helps kids identify how they can make a difference. Anyone can form a Roots and Shoots group, and there are thousands of children now working on service projects related to the program. For folks looking to not only get their kids out into the woods but also teach them to preserve those things they love, this program seems like a great way to get started. You can search for local groups, or learn how to start your own here.